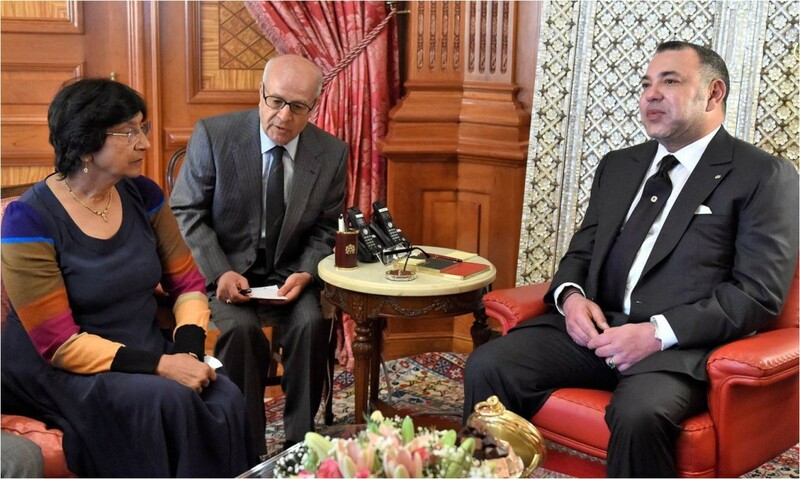 MAP/Maroc.ma (Rabat, Morocco, May 27, 2014) — King Mohammed VI today received the UN High Commissioner for Human Rights (HCHR), Navi Pillay, at the Royal Palace in Casablanca. Earlier in the day, Ms. Pillay also met with Morocco’s Minister of Foreign Affairs and Cooperation, Salaheddine Mezouar, in Rabat as part of a four-day official visit to Morocco at the invitation of the Moroccan government. 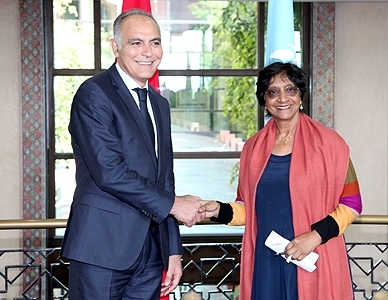 This is Ms. Pillay’s first official visit to Morocco since she took office in 2008, and provides an opportunity to confirm Morocco’s continuous and close partnership with the UN on human rights, and Morocco’s irreversible commitment, spurred by King Mohammed VI, to consolidate, protect, and promote human rights and defend basic freedoms. In their meeting, the King recognized Ms. Pillay with the Alawite Wissam of Grand Officer rank for her strong commitment and very active role in the promotion and defense of human rights during her mandate as head of the HCHR, said a statement from the Royal Office. The Moroccan sovereign also lauded efforts by Ms. Pillay to reinforce the credibility of HCHR actions, enhance its operational capacities, reform the system of treaties, and throw light on new issues such as the fight against discrimination and intolerance, and the rights of immigrants. For her part, Ms. Pillay lauded the major progress and sustained efforts made by the Kingdom, under the leadership of King Mohammed VI, for the important cause of human rights in every sense. The talks focused on the emergence of new generations of human rights and the need for their promotion, said the statement. The meeting was attended by HCHR director for MENA region Hani Magali, the King’s advisor Fouad Ali El Himma, and Foreign Minister Salaheddine Mezouar. During her stay in Morocco, the UN high commissioner will meet the Head of Government, the Minister of Foreign Affairs and Cooperation, the Minister of Justice and Freedoms and the Inter-ministerial Delegate for Human Rights. Her schedule also includes working sessions with the Speakers of the two chambers of Parliament, the President of the National Human Rights Council (CNDH), the Chairman of the Economic, Social and Environment Council (CESE), and representatives of the Moroccan civil society.